I love springtime in Gabs!!!! Although it is very different from springtime in Canada you can definitely see the change in seasons. Many of the trees are dropping their dry dead leaves while others are bursting with blooms and blossoms. 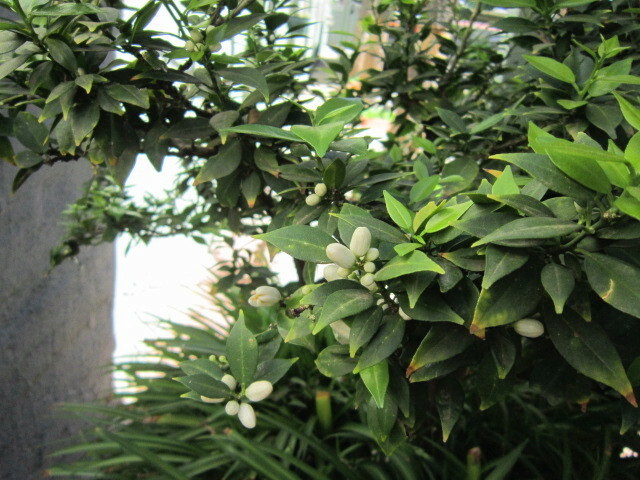 The orange tree outside of my apartment on my private terrace is now fully in bloom! Every time I am outside and take in a deep breath, I can smell the surrounding citrus trees in blossom which is a heavenly scent to me. It actually reminds of being in Morocco during blossom time. While Gabs still has a way to go before it is the sensory overload that you experience in Morocco where all of your senses truly come alive, it is making me so happy to experience. It is nice that my final weeks in Gabs will be filled with things that make me happy and glad to be living here. Every where you look are blossoms of varying bright colors of deep pink, purple, white and yellow. The other day when Buche was driving me downtown and we passed by some trees in full bloom in the center of the road I asked him what kind of trees were they? His response, he didn’t know. “They were foreign trees that don’t grow here”. Of course, I proceeded to argue with him that they were in fact growing here as I could physically see them with my eyes, ha! As the man with an answer for everything, he succinctly replied that “foreigners had planted them and they did not grow here naturally. As a foreigner I threatened to bring back a native tree from Canada to plant here too just so I could torment him about it. But for now, I have given up trying to identify the different species of trees and shrubs in bloom…I have so little time left with Buche that I don’t want to spend it arguing over tree identification. I can think of much better things to disagree on 😉 I am focused on making sure that my final couple of weeks with him are not boring so if he crys when he takes me to the airport it will be from relief that I am finally gone, not from heartbreak as he is threatening me. So spring has finally come to Gabs and with it beauty and warmer temperatures. I am happy to be out and about, breathing in the amazing scents (and even experiencing the stuffy nose that goes with it) and enjoying the eye candy of gorgeous blooms ever where I look. And enjoying the 30 degree temperatures before I head back to an equally beautiful Canadian fall and much cooler temperatures. I am truly blessed because I will get to experience both! How much better could life get than that?